The Louis Jay Horowitz estate designed by Hunt & Hunt c. 1918 in Lattingtown. Horowitz was the president of the construction firm Thompson Starrett Co. That construction company built such NYC projects as the Woolworth Building, the New York Herald Tribune Building and the Equitable Building among others. The residence was demolished in 1954 but sat on Skunks Misery Road. 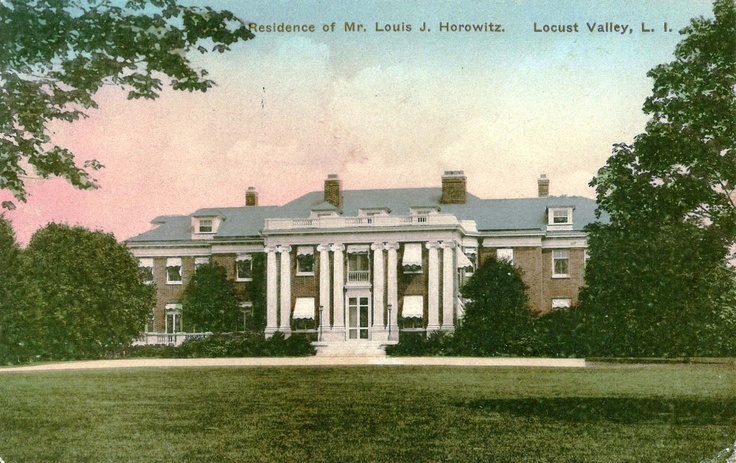 Click HERE for more on the Horowitz estate. Postcard courtesy of the Gary Lawrance Collection. The current vertiginous trend in high end real estate leaves one with a serious case of the bends. Even as the market overall continues to be flat, prices at the top are doubling and tripling in short periods of time. The explanation is easy---more billionaires than ever, but a fixed amount of prime land. And there you have it. A complete re-arrangement of who can afford what.